TC Winston has ravaged Fiji, leaving a trail of destruction that will take a lot of time and resources to rebuild. Several local and international organisations including governments, NGOs, and business enterprises were quick to deploy relief efforts in various parts of Fiji. Itâ€™s inspiring to learn how these organisations have been able to mobilise their people and get some of the mammoth tasks done so swiftly. While strategies would differ between organisations, something worth noting and commendable is the enthusiasm and effort of volunteers. I was fortunate to volunteer in Vodafoneâ€™s Red Alert programme that saw the delivery of over 1000 relief packs to victims of TC Winston. 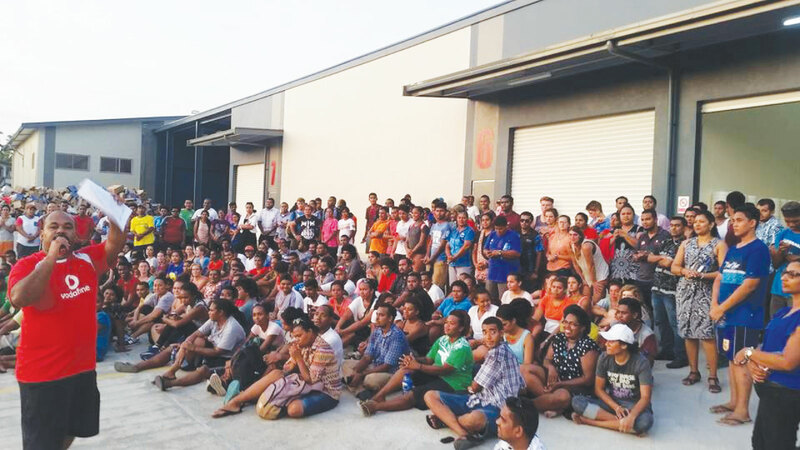 The Fiji Council of Social Services (FCOSS), one of Vodafone ATH Fiji Foundationâ€™s charity partners, was roped in to mobilise volunteers to help in packing the relief items. At 1.30PM on Monday 22 February, FCOSS Executive Director Neil Maharaj communicates with his existing volunteer network. Then he makes a call for volunteers on social media. Some 100 partner charities are also emailed. 7 am Tuesday morning Neil and I are on the road to the west to attend the National Disaster Coordination meeting at Commissioner Westernâ€™s office in Lautoka. It is not a typical quiet ride. Neilâ€™s phone keeps on ringing. There was a surge of calls from people wanting to volunteer. By the time we returned to Suva at around 9 pm, Neil had received over 100 phone calls, over 150 emails and several messages on Facebook. â€œWe have done this before, but this time, the response is unprecedented,â€ says Neil. â€œWhat one volunteer can do is small, but what all of us can do is enormous for recovery, it creates a stronger power,â€ adds Neil. And that power was so visible at the Narseyâ€™s Plastic Warehouse in Laucala Beach where Vodafoneâ€™s relief stock was being repacked into ration packs. Over 400 volunteers flocked to this venue to assist in packing the goods. The scene, enthusiasm, and drive of these individuals are beyond explanation. â€œItâ€™s been an incredible journey with these volunteers. In two days the Vodafone Fiji ATH Foundation has extended the family ties to those who care and want to make a difference in the lives of the victims of TC Winston,â€ said Foundation Director Divik Deo. One of the most visible faces of volunteerism appears in disasters. The Foundation and its charity partners were first responders in the aftermath of floods that hit the western division in 2012. Most of those mobilised for relief assistance were volunteers including youths, workers, and men and women from various works of life. â€œVolunteerism strengthens our social infrastructure. Communities with more trust, civic engagement and stronger networks have a better chance of recovering after a disaster,â€ says Neil. â€œRecognitions like the UN Volunteer Awards provides incentives for sustainable volunteer action but we need a more structured approach at the national level,â€ says Neil. The Foundation had funded $220,000 in 2012 for the establishment of FCOSS National Volunteer Centre (NVC). The centre has over 6000 registered volunteers and runs capacity building programmes.